This holiday season TriMet will once again detour bus lines that serve the Clackamas Town Center Transit Center. Ten lines travel through the mall’s lot to reach the transit center. By adjusting their routes on Black Friday and other busy holiday shopping days, this lessens the traffic in the lot and helps keep our buses on schedule. New this year is the time of the adjustments: Buses will detour from 12:30 p.m through 5:30 p.m. 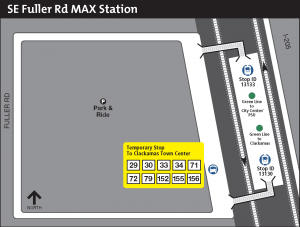 They will serve a temporary stop at the SE Fuller Rd MAX Station, about a five-to-ten minute trip from Clackamas Town Center, to allow riders an easy connection between bus and MAX. Riders should plan an extra 20 minutes for these trips. TriMet first began these adjustments in 2012 and they proved successful in helping buses stay on schedule. Our operations team will be on site to monitor the detour and make further adjustments if traffic impacts increase. 12:30 p.m. to 5:30 p.m. Eastbound buses will go just a short distance into the parking lot before detouring to the SE Fuller Road MAX Station. The mall stop at the theater (ID 12921) will be closed and eastbound buses will serve a temporary stop on Driveway #3, which runs between the theater and Monterey Avenue. Westbound buses will serve a temporary stop at SE Fuller Road MAX Station before serving the regular Clackamas Town Center Mall stop (ID 12922) across from the movie theater. Stay onboard your bus and transfer to the MAX Green Line at the SE Fuller Road Station. 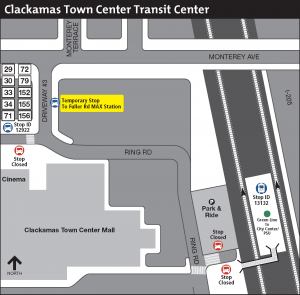 Exit your bus at Clackamas Town Center Mall stop and proceed about a ½ mile to Clackamas Town Center TC MAX Station, which remains open. Board a bus at the temporary stop on Driveway #3, between the movie theater and Monterey Avenue, and transfer at SE Fuller Road MAX Station. Proceed about a ½ mile from Clackamas Town Center TC MAX Station to the regular Clackamas Town Center Mall stop (ID 12922). Exit MAX at SE Fuller Road MAX Station and board a regular service bus at the temporary stop in the parking lot. Plan an extra 20 minutes to trips and dress appropriately for the weather as the temporary stops do not have shelters. To ensure the safety and comfort of all passengers, please avoid bringing large strollers. On buses, all strollers will need to be folded for safety. Holiday shoppers are welcome to bring bags and packages with them, but must make sure they don’t block the aisle, stairs or doorway.